Click here for audio of Episode 1219. Today, a chance meeting with a hero. The University of Houston's College of Engineering presents this series about the machines that make our civilization run, and the people whose ingenuity created them. Two older men in the Museum book shop were talking about flying in WW-II. I asked one, "What did you fly?" "`24s," he said. "In the Pacific?" I wondered. "No, we flew out of Italy -- over Ploesti." My jaw dropped, for I knew what that meant. But I'm ahead of my story. We'd just been through Galveston's Lone Star Flight Museum - their fine collection of WW-II airplanes. It was a remarkable experience walking among all those machines that'd lain at the center of my childhood -- airplanes I'd never seen so close up. Background speakers played Glenn Miller music. 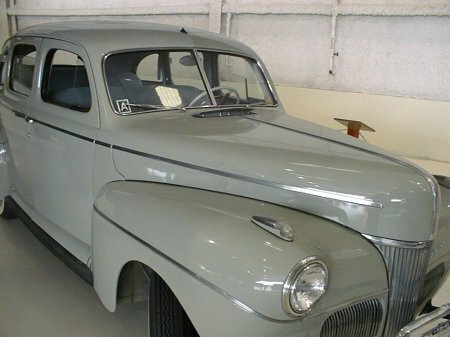 A small but important item on the hangar floor was an old car with an A-sticker on its window. "A" was the tightest gasoline rationing level. This war was fueled by petroleum and gasoline was precious. Germany got petrol from the Ploesti oil fields in eastern Romania. Hitler had said that if the Ploesti refineries were destroyed, the damage would be beyond repair. So damage them we must. But how? They lay out of reach of Allied bombers. Two elements finally came together in 1943. First the British and Americans took North Africa. 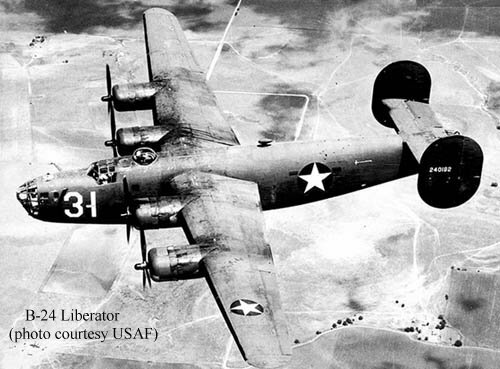 Second, the Americans brought in the B-24 heavy bomber -- the Liberator. The B-24 was designed more for range than bomb capacity. It had a nominal range of 3500 miles and now it was available. The first great Ploesti raid left from Benghazi in Libya on Sunday, August 1st, when few Romanians would be at work. 1726 men took off in 177 B-24s, overloaded with defensive armor. The first casualty on that 2700-mile trip was a plane that crashed on takeoff, killing all hands. The planes attacked Ploesti at treetop level -- flying into flak, machine gun fire, fighters, and barrage balloons. Their aim was no less than to shut off German petrol supplies. But things went wrong. The element of surprise was lost. Airplanes were shot down over the oil fields and on the way back. American losses approached 800 men. Estimates of lost airplanes are uncertain -- maybe 70 heavy bombers. In the end, we paid a terrible price for shutting off sixty percent of Germany's oil -- and then we only turned it off for a while. What we did in 1943 we had to do again -- and again. And I'm back to that museum shop. "We went out to Ploesti in 27 planes one day in 1944," the man said. "Only 14 came back. I was 19 years old. I was a ball gunner. He left me at a loss for words, trying to add it all up. He'd flown 51 missions -- dangling out in the flak in that bubble on the plane's body, with only luck to protect him. I'm five years younger than he -- that close to having been in that, or in some other, shooting gallery myself. But it'd been him, not me. I had momentarily brushed up against heroism, a virtue we find all too hard to believe in today. And it had been heroism on my behalf. Wolff, L., Low Level Mission . Garden City, NY, Doubleday & Company, Inc., 1957. See also Ardery, P., Bomber Pilot: A Memoir of World War II. Lexington, KY: 1978.